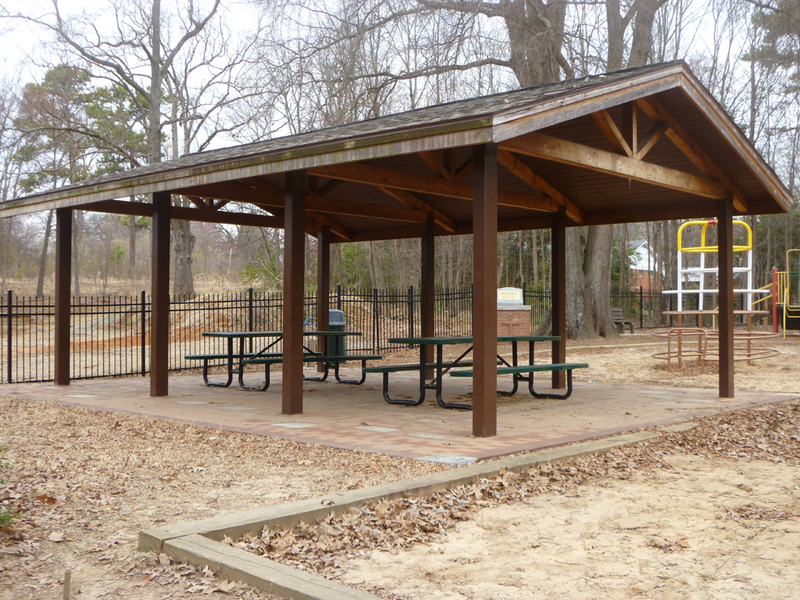 Jake Grogan from Troop 80, sponsored by the Pleasant Hill Presbyterian Church, was the 3rd Eagle Project at the Nobles Burnette Playground replaced the original pavilion at . When JPM acquired the property it was in disarray. The pavilion roof had holes and some of the deck boards were rotted. The original scope was to remove the shingles, replace any deck boards required and re-shingle. Once the shingles were removed it was discovered the deck was in a lot worse shape than anticipated. About 1/3 of the lumber had to be replaced. Once the deck was removed it was found that 2 of the trusses were damaged beyond repair. The 2 remaining trusses could not be matched so all 4 had to be replaced. The Scout Project was put on hold. JPM assisted and purchased the material for new solid cedar timbers. A Master Craftsman was hired by JPM to assist the Scouts with building new trusses. Once that was complete, Jake's project resumed and the deck boards, new shingles, and cedar fascia was installed. What was anticipated to be a 150 man hour project turned into a 750 man hour project. This project was completed in 2008.